With the “Beast from the East” a distant memory, we were rewarded in May with some beautiful weather. If you are planning a barbecue, we have a few Barbecook stainless steel ones in stock that are quick and easy to start and control along with a range of barbecue tools and fire baskets. 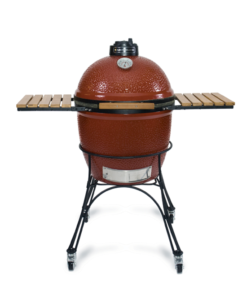 For adventurous chefs, we have the Kamado Joe, capable of cooking everything from a large roast to a pizza, and the Bradley smoker. Tired of cutting grass? 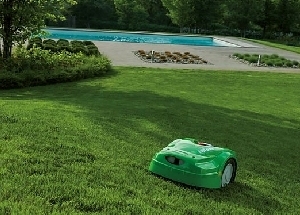 Time to look at a robotic lawn mower. The Viking range of iMows will look after up to 4000 sq. meters of lawn. We have installed several iMows this year, they work away quietly leaving their owners time to enjoy other pursuits. If you would like to see one in action, please come and see our demonstrator at Dalreoch where it has been working for almost a year. For the larger lawn our range of Viking lawn tractors is very impressive and robust with prices starting at £2290.00. We also have a full range of 4-wheeled and rear-roller mowers which include electric, petrol and cordless machines. Stihl and Viking will be merging over the next year so don’t be surprised when you see the change of colour from Viking green to Stihl orange. Don’t worry about spares as Stihl are guaranteeing them for at least ten years and for most models the only change will be the colour. Stihl have introduced a popular range of cordless garden equipment including a hedge trimmer, blower and strimmer priced at only £99.00. The great benefit of cordless operated machines is that they require no fuel, they operate at very low noise levels, and there are no cables to cut or wind around the trees. You can try out any of these machines at our showroom. We are very excited to have completed the update to our website www.mowersrus.co.uk We think it is more user friendly and hope you do too. Just log on and follow the links to our major suppliers and when you have seen what you want just pop into the shop for some hands-on experience.